The very successful 2015 fishing season is coming to an end and Gray FishTag Research is gearing up for yet another great 2016 fishing and tagging season in Costa Rica. Costa Rica with its incredible fishing destinations and beautiful waters proved to be the perfect starting location for the GrayFishTag program. The success we are enjoying would not be possible without the support of the hard working Costa Rica professional fishing community, and our Official Research Centers Los Sueños Resort & Marina, Crocodile Bay Marina, Marina Pez Vela, and The Zancudo Lodge as well as our latest addition The Pisces Group out of Cabo San Lucas, Mexico and Grande Alaska Lodge. The program started in Costa Rica, followed by South Florida, Mexico and Alaska. The tagging rate and overall willingness to be involved has been overwhelmingly positive, and more importantly the recapture rate has been unbelievable. Recently we have encountered weekly recaptures! Included species are Swordfish; a Bull Shark that was in liberty for 128 days, another Bull Shark that was originally tagged off of Miami and 41 days later recaptured outside the tip of the Florida Panhandle… truly amazing. Since the program launched in early January 2015, over 8,000 Gray FishTag Research tags have been deployed worldwide on a total of 44 different fish species. Sailfish, specifically Pacific Sailfish, is the most registered fish species. Followed by Scalloped Hammerhead, Roosterfish, Blue Marlin, and Pacific Halibut. A total of 44 fish species have been registered with GFTR. The two Bull Shark tag recoveries are very interesting, especially the distance between tag deployment and recapture for the bull shark was over 650 miles in a time span of 41 days. 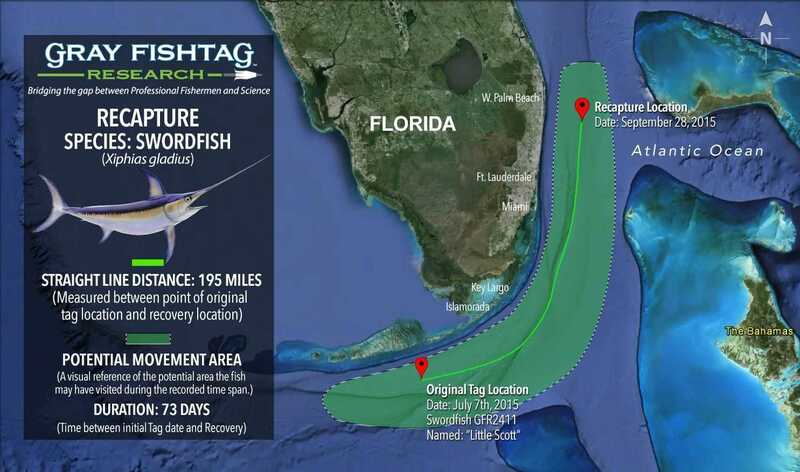 The swordfish tag recovery is all very interesting. The distance between deployment and tag recapture was approx. 195 mi and the time span was 73 days. The 1st ever successful deployment of a PSAT (sat-tag) on a roosterfish. The roosterfish had average dive depths of 19ft and its deepest dive was to 93ft, which is much deeper than most people suggested. Moving forward, Gray FishTag Research will be an essential tool for promoting the conservation of marine game fish and increasing public resource awareness. In addition, the program will provide biologists and scientists from around the globe with valuable data on migration patterns, fish stocks and growth rates.